To begin the year, we have a special post to honor all our Ratatouille’s, Ramsy’s and of course the brilliant home cooks across the globe. Well, even if you don’t consider yourself any of the three mentioned above, but still boast the knowledge of savoring and relishing the herbs and spices in your food (the advantages of being a true foodie), having a herb garden will always be an added bonus in your home. Whether your home has space for just a single container or just a small room, these below mentioned 10 ideas will help you create a herb garden regardless of the surface area in your home. Urban homes or apartments generally offer very limited space for gardening and that is one of the prime reasons why a container herb garden is very popular in cities. The container herb garden can be easily installed on a balcony or a window that receives plenty of natural light. The design of the container garden, of course, depends on the type of container you decide to use. Planting a herb garden against the fence will help to keep the soil warm as the sunlight reflects the light and warmth back to the garden. Planting the garden along the fence also protects the herbs from the wind. The most important element to keep in mind while designing a small herb garden is to keep everything accessible (at arm’s length or at eye level). 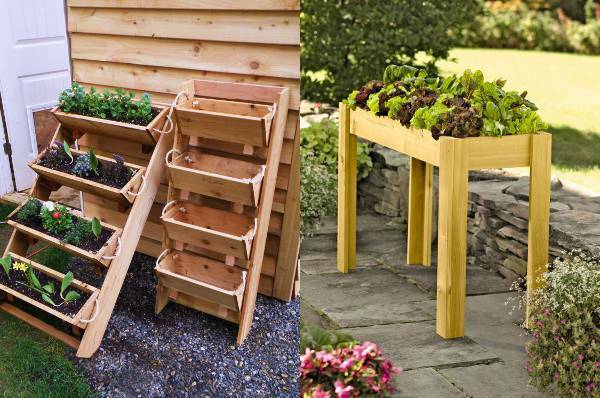 The raised garden is a great option to save you from a lot of bending and stooping. Lower raised gardens are especially good if you live in an area with rocky or clay soil. 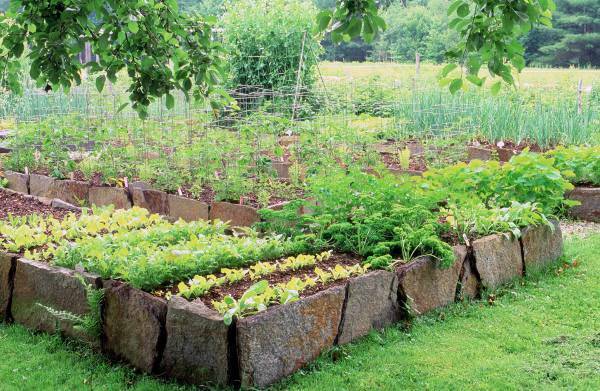 Use square foot gardening approach, it will help you minimize weed, conserve water and maximize the yield. You can easily designate one square for each herb. 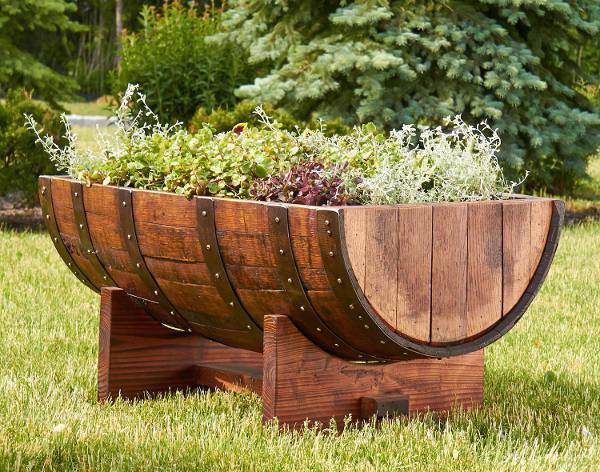 There are three styles of raised herb garden bench designs available in the market. First, is the freestanding version that comes with a good 31 inches height. This ensures that you don’t have to bend too low to clip or water your herbs. 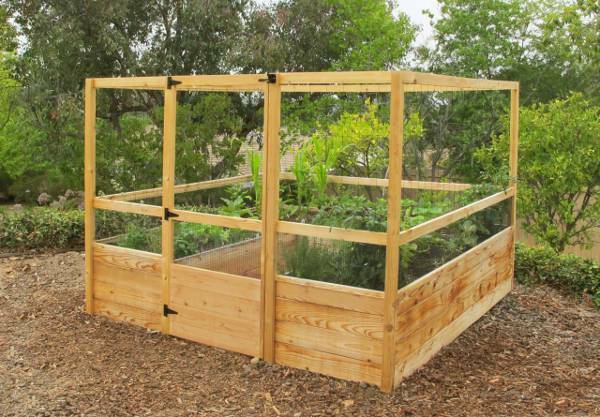 Second is the composite raised garden kit which is very easy to assemble and maintain. A third option comes with a very cool design with hinged fencing, a great alternative to keep off the bunnies from hopping on the bench. 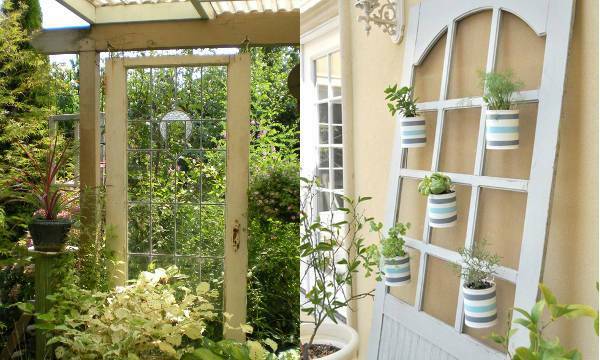 With the heaving and trending craze of DIY, make your very own herb garden by repurposing an old door. Paint the door with a good quality chalkboard paint and hook and fix some planters and pots to convert the door into an instant herb garden. Wine crates can brilliantly serve as an efficient herb garden. Just add the drainage facility by simply drilling holes in the bottom. Add a bit of gravel and thicken the soil bed, afterward, plants the seeds and place the crates together for a refreshing and appealing upgrade. 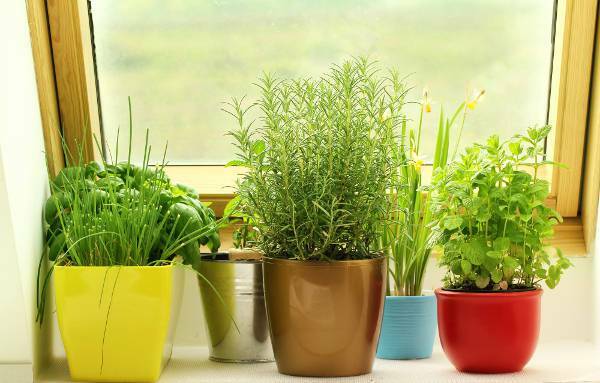 You don’t necessarily need to go outdoors for starting a herb garden, indoor herb garden serves just the similar purpose. 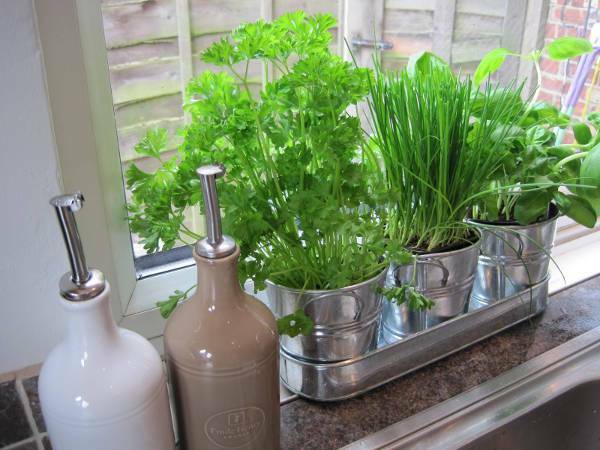 You can use wooly pockets or assembled pots for the indoor herb garden. Shelves or horizontal containers offer a limitless advantage in indoors. 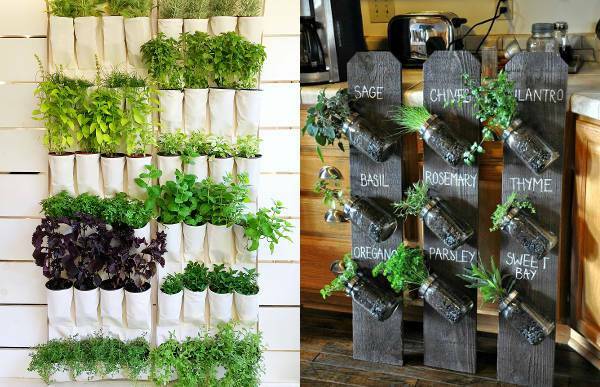 They can be placed right in the kitchen and you can pluck and enjoy the herbs straight from your culinary space. 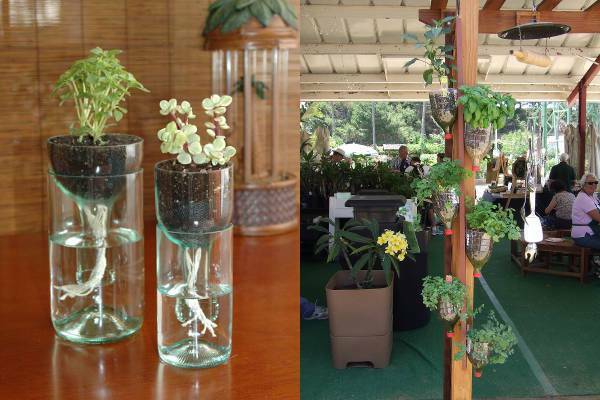 Bottle garden is another convenient and creative way to grow herbs in your indoor space. Taking a minimal area and featuring a simple design, the bottle herbs can be easily placed near the window panes or the desks. 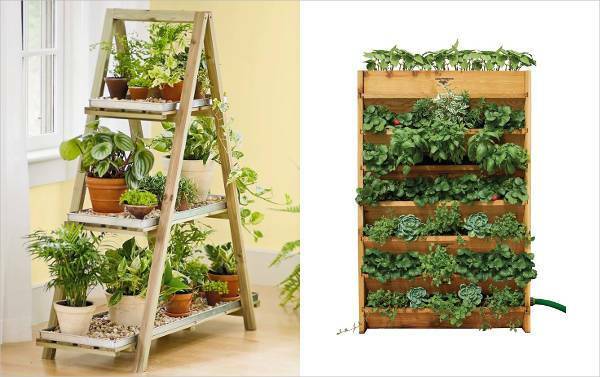 The vertical garden is another efficient choice for a herb garden. Taking up insignificant floor space you can grow the vertical garden by analyzing your convenience and height of the wall. 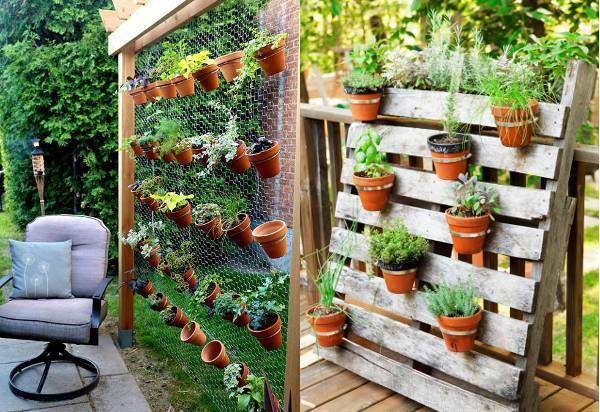 You can use wire netting or wooden backboard for your personal vertical herb garden. Bring in the health and goodness to your home with these impressive and easy to assemble and install herb gardens.